We set our expectations high, wanting to better our lives. And then we fail. Why oh why does it happen every year? Hope is, hands down, one of the most powerful components in the success of our New Year’s resolutions. This is because New Year’s resolutions are most often about improving ourselves and overcoming obstacles in our lives by changing how we think, feel or act. Hope is the secret sauce to avoid being overwhelmed by challenges or setbacks that occur while we are on the road to making changes. Hope is often misunderstood. It isn’t prayer, optimism, dreaming or wishing. It is not obstacle-free, and it certainly doesn’t offer all the answers. We can never have all the answers for how to achieve a new goal. But that’s where hope steps in. Hope is born out of times when we need to make changes that will impact on our lives. During these times we need to develop new coping skills and explore previously untapped resources within ourselves and our greater circle of support. There are three essential components of hope. Each is vital in helping us make necessary decisions and find the will-power to endure any hardships along the way so that we can successfully reach our goals. The first component of hope is creation of the goal. It doesn’t matter if our New Year’s resolution is to lose weight, look for a new job, save money or start exercising. Any goal we make helps us to focus on what we’d like our future to look like. This focus makes the possibility of reaching our goal more real, because we’re making that important move from merely wishing or dreaming to being real and achievable. Goals must have clarity. Vague goals, and huge overwhelming goals, instill little motivation. For instance, instead of one large New Year’s resolution of wanting to lose 40 pounds, breaking the goal down into measurable steps (for example, detailed plans on how to lose two pounds a week), will help us be more successful. Goals need to be in sync with that which we need and value in our lives, or our commitment will wither and our attempts will falter. The second component of hope is being able to come up with a detailed plan to achieve our goal, which may include more than one way. Regardless of our best laid out plans, inevitable barriers to achieving these desired changes will pop up. These barriers are our kryptonite, threatening our stamina to stay the course and succeed in attaining our goal. When we aren’t sure whether to persist or give up, it is hope that will remove our uncertainty of how to persevere. According to hope researcher and psychologist Charles R. Snyder, being able to envision and develop different routes around unexpected obstacles will allow us to recover, make necessary adjustments, and keep moving forward towards our goal. The third component of hopefulness is that of envisioning ourselves as successful. 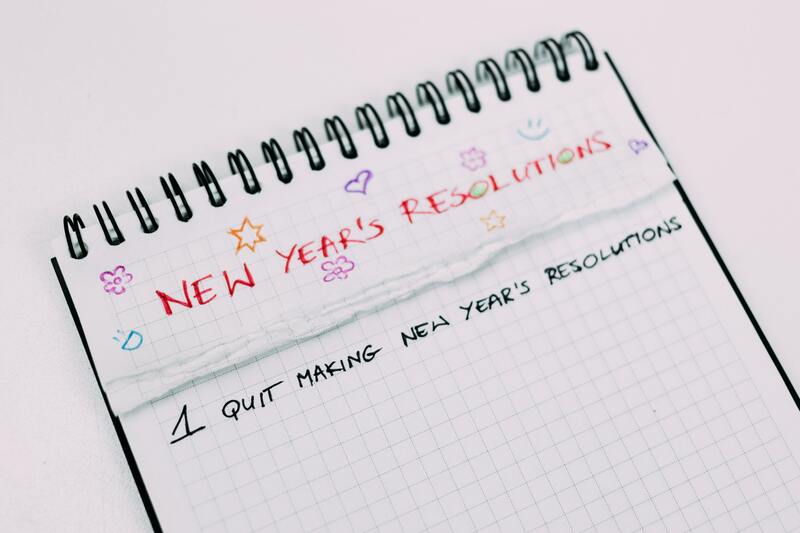 Think back about your mental will power over previous New Year’s resolutions that fell flat after a short period of time. When things started going south, did your mood become negative? This is understandable because when we experienced a setback to attaining a goal, we may have felt burdened by feelings of discouragement, self-blame, guilt or anger. Rather than carry the weight of these emotional burdens, we shrugged off any expectation we had of reaching our New Year’s resolution as hopeless. The journey to success in achieving our New Year’s resolutions is different when the three components of hope are utilized. When we have a clear and detailed picture of what our goal looks like, the path to accomplishing the goal, and we recognize from the onset that there will be bumps along the way requiring alternative planning, we are more likely to perceive setbacks in a less self-defeating manner. In fact, unlike past experiences with New Year’s resolutions, we will find that we are still able to expect a positive outcome. We will feel confident. Resilient. We will accomplish our goal! How this happens is not a mystery. Scientists have abandoned the long held belief that our brains are rigid, and now view them as flexible. Known as neuroplasticity, our brains have the ability to adapt and change structure throughout our lives. While our gray matter is a part of our inherited DNA, we are able to ‘re-wire’ our brains in a good way when we experience repetitive positive thoughts. This is evident in each component of hope. When we create a concrete goal, evaluate obstacles standing in the way of achieving our goal, and remind ourselves that we can take different paths if we encounter roadblocks, our anxiety declines. We will be less focused on negative or distracting thoughts, and our energy will instead be directed toward alternative helpful ways to accomplish our goal. When we engage in this type of thinking we break the pattern of defeatist thinking and rewire our brain in a way that increases our resilience. Enjoy making this year’s New Year’s resolutions a reality. Incorporating hopefulness will not only help you achieve these goals, but can also provide you with a pathway to greater happiness in many aspects of your life.